It's cookie time! 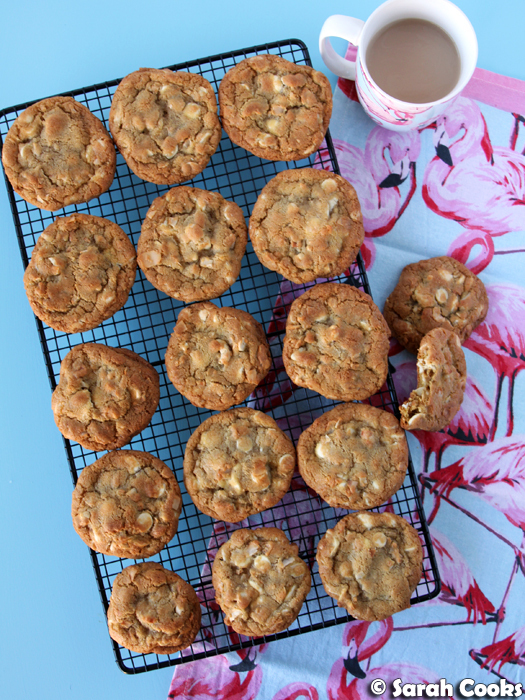 These cashew, coconut and white chocolate cookies are super buttery and soft, studded with crunchy roast cashews, fragrant and chewy coconut, and sweet pops of white chocolate. This is my cookie of the summer! These cookies are your all-American Mrs. Fields-style cookie - generously sized, soft and buttery, with lots of chunky add-ins. I am totally loving the tropical flavours at the moment! 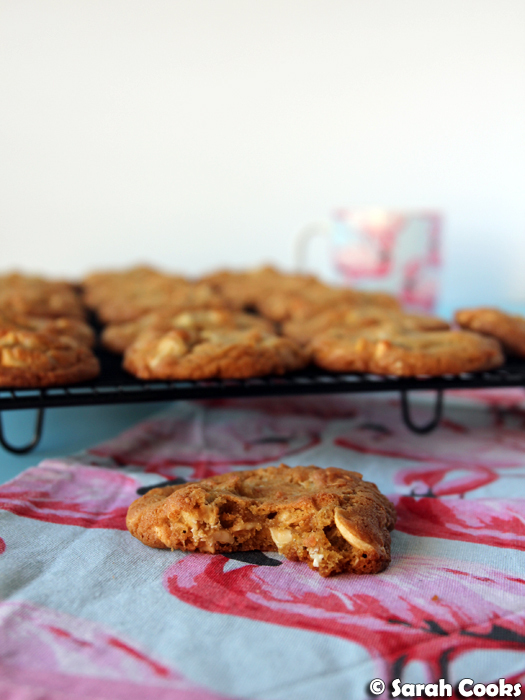 We had the Inca Berry Granola, and the Tropical Tarte Tatin, and now these cashew, coconut and white chocolate cookies. What can I say? I'm just super ready for summer! How good is it having light for longer after work? And nice sunny weather on the weekends to enjoy? It's awesome. When I made the Inca Berry Granola, the smell of the coconut and cashews roasting in the oven was just sooo tempting. I knew it was a perfect match, and I thought the combo would be great in some cookies. 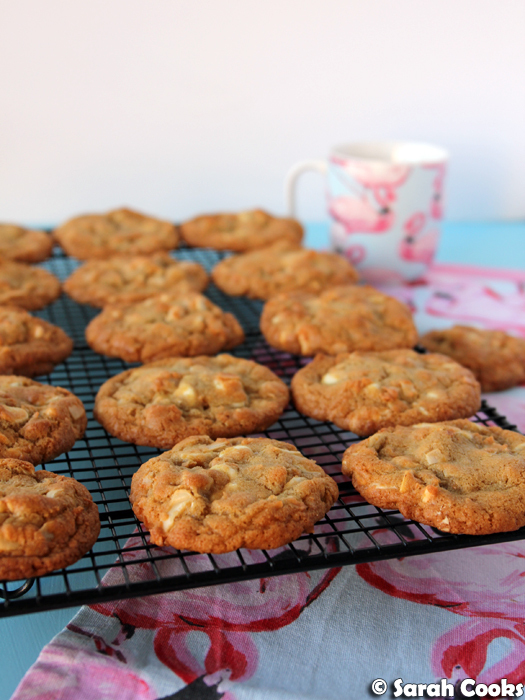 I also had some white chocolate chips in the pantry (disclosure: they were gifted), so the only sensible thing to do was to get baking. 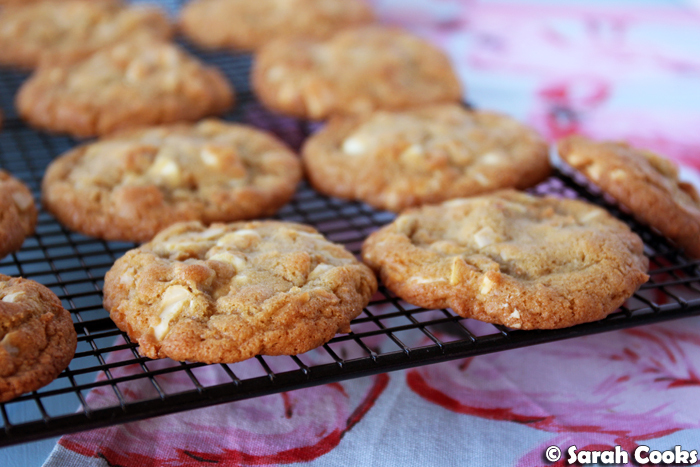 (I figured white chocolate would go well with the cashew nuts, just like the macadamia and white chocolate cookies that I love so much). I based them on my standard choc chip cookie recipes, with a few special tweaks for extra deliciousness. 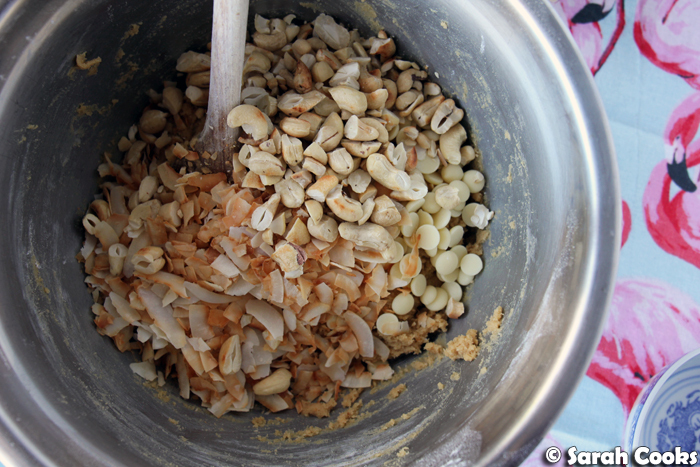 I roasted the cashews and coconut flakes in a dry pan (and let them cool) before adding them to the batter. Don't skip the roasting; it really enhances their flavour and makes them stand out. Also bonus: it will make your kitchen smell awesome. I used an ice-cream scoop to portion out the dough, to make sure they were all evenly sized and shaped. My particular ice-cream scoop is just under a quarter cup (60 millilitre) capacity, and I filled it just under the rim for each cookie. Also, the common wisdom is to refrigerate cookie dough overnight before baking; I have managed to achieve this basically zero times in my life. If you have more patience than me, or if it fits in with your timing better, then go for it! But for me, when I make cookies, I WANT cookies! I personally would only refrigerate the dough if it was too melty and soft to scoop into neat cookies, and even then it would only be until it firmed up again. Oh, and I usually refrigerate the remaining dough between batches, again, to prevent it from getting melty in a warm kitchen. If you don't have an ice-cream scoop, you could of course just use a spoon and roll the dough into balls (heh) with your hands. I find there's no need to flatten the balls, as they spread out in the oven. In the heat of the oven they start to puff up, and then sink down as they spread, forming a nice wavy pattern as they rise and fall. When I see them baking I always think of an old-timey lady in a hoop skirt slowly sitting down and elegantly arranging her skirt around her. I guess it's because I'm super weird but also because I really liked Gone With The Wind as a child? Anyway, back to the cookies! Portioned out into balls I think they look nicer than rolling the dough into a log and slicing it thinly, which is another option, as per David Lebovitz' also delicious chocolate chip cookies. And that's it! They're a simple bake, all you need is an hour or so, and you don't even need a mixer. (I prefer to use a wooden spoon, a bowl, and some elbow grease). Your reward for some minor efforts will be a warm and fresh batch of some of the most delicious and best-smelling cookies ever! Toast the cashew nuts over a medium-low heat in a dry frying pan, stirring often, until lightly golden brown and fragrant. Tip onto a chopping board and allow to cool before chopping roughly. Toast the coconut flakes in the same frying pan, stirring often, until golden brown and fragrant. Tip into a bowl and allow to cool. 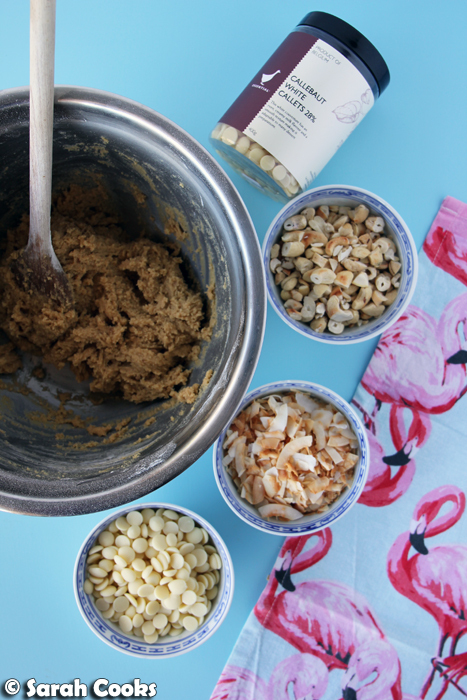 Beat the butter and sugars in a mixing bowl until smooth and creamy. Sift over the flour, bicarb and salt and mix until combined. 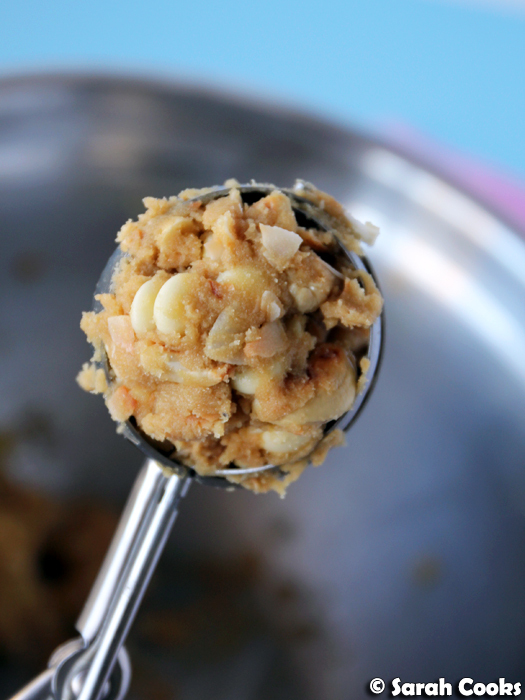 Add the cashews, coconut and white chocolate chips, and stir until combined. Optional: cover the dough with clingfilm and refrigerate overnight. This is supposed to make the dough better but I never bother. When you are ready to bake, preheat oven to 175C and line a baking tray with baking paper. 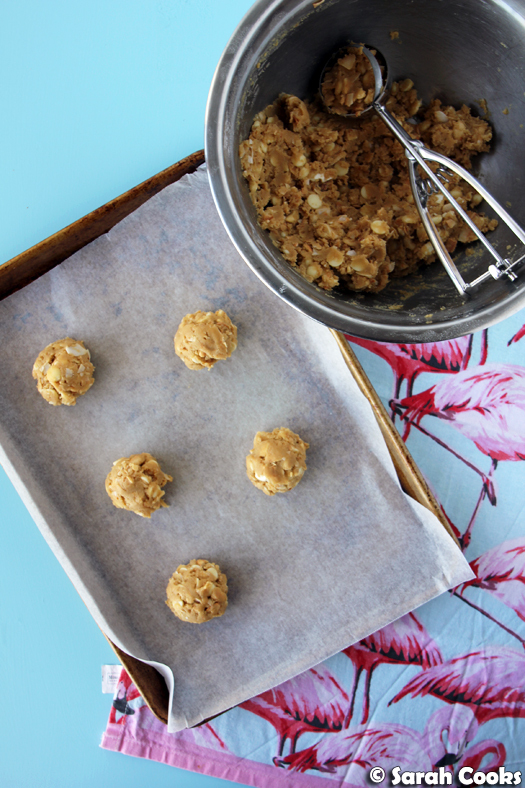 Portion out the dough into balls and arrange on the baking tray, leaving lots of room to spread. (I use an ice-cream scoop that is just under 1/4 cup capacity and I fill it just under the rim). Bake for 8-10 minutes or until lightly golden brown, rotating the tray halfway through baking. Allow to set on the tray for a couple of minutes before transferring to a wire rack to cool completely. Ooh I'm in a cookie mood now! These look awesome. And a big YES to the extra hours of light!